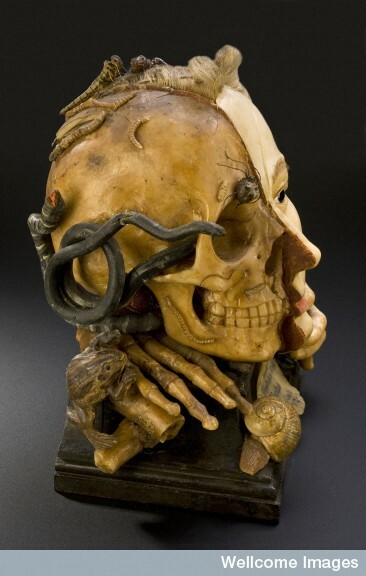 How would you feel about featuring this objet d'art on your mantelpiece or side-board? Reckon this two-faced figurine might put you off your Cornflakes? Quite frankly, I'm unsure which side I find most scary: the fair or the foul. I suspect the witches from Polanski's Macbeth may be the only ones to covet a great many of the collectibles Sir Henry fancied. This fashion-forward female has gone a step beyond two-faced and moved into Split-personality-ville. 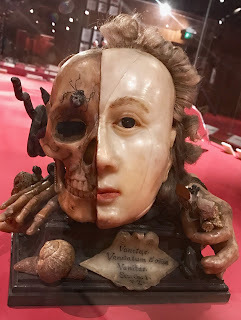 And the chirpy expression memento mori translates to 'Remember you will die'. So the purpose of these beauties was to remind you that life is fleeting and vanity is futile. In fact, pretty much everything is futile, because we're all going to end up as worm food anyway. heading for his eye socket, I particularly like the frog on his shoulder. I think the one to the left is my very favourite. Not only is this little Italian masterpiece enticingly framed, but it would fit neatly into your palm. It would slip comfortably into your average 18th century pocket or hand-embroidered purse. I like to imagine someone fabulous resplendently whipping it out like a compact as they head off to powder their nose. Yes, I've heard of these. A bit depressing for my taste! And typical of their time. Gee, I hope you didn't find my post depressing. that's the last thing I intend. 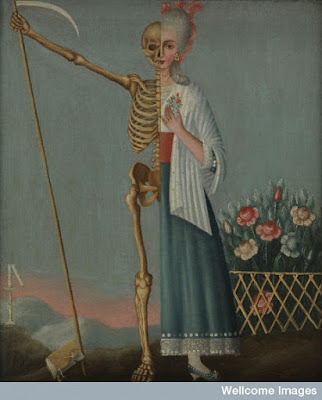 The oil painting from the 1800s reminds me that no matter what we look like on the outside, thick or thin, we all are the same at the skeletal level. Furbelow???? off to google what that means, besides the obvious naughty definition that you already nixed! It's a spiffy word. I'm thinking of time-travelling back to spend some time with all the British Victorian writers to pick up a few tips. You're welcome. Glad to be of service at any time. Hope it's not too traumatic a day. Thanks for struggling through cyberspace to find me. I tried my daughter...she failed me! As for your link it could be some extra characters that got added when you were pasting it probably?? Somehow I manage to do the wrong thing with monotonous regularity. Oh dear. Now you have me worried. It's that sarcastic Aussie sense of humour ~ not shared by all, but unavoidable in my family. Indeed it is - send me an email crg.galvin[AT]gmail[DOT]com and I'll send you a document with the linky thing explained clearly and with some of your links ready made so you can see what they should have looked like. :)). You have to keep all the carets < in the right place along with the " and the space between the a and href. I actually like the morbid quirkiness, don't know what that says about me :) And I loved your tongue in cheek take on them too. Here from the A-Z, and thoroughly enjoyed your post! Thanks for visiting. It's reassuring to know that there are others who share my interest in morbid quirkiness. Yeah, those would scare my kids. Very cool though. I guess death arrived more swiftly and more often than it does for us. Oh, I almost missed froggy! Thanks for that catch! Another entrepreneurial fail by Sir Henry! Froggy IS very glad you didn't miss him. Very interesting. I think the fair side of the first one is scarier. Very uncanny valley. Thanks, Alex. I think I agree. To be truthful, I'm not sure she has too much to be vain about. Sometimes all I need is a mirror and it has exactly the same effect. Even more than your topic I enjoyed your post because you are a wonderful writer! Great choice for today's letter! Thanks for sharing! Thanks for the compliment, Elaine. I am enjoying the challenge, and my theme is proving to be a productive one for me. Furbelow! Hehehe. I know. I always go for silly stuff that makes me laugh. But hey, I would NOT want to feature those anywhere in my living space. 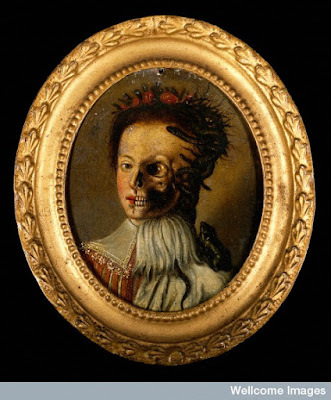 But how intriguing they should have a whole collection of these...um...macabre objets d'art. So exciting that the folks at Wellcome acknowledged your blogging about them! Furbelow is a difficult word to drop into a day-to-day conversation, but I'm sure you're up for the challenge. I'm glad I contributed to your daily collection of smiles, Vidya. Your A-Z posts are really interesting and I'm enjoying them as and when I can - not time to leave loads of comments right now but looking forward to learning more. Thanks, Wendy. Wellcome is a pretty interesting place. I understand entirely that when you're doing the A-Z the hours seem to slip away. Catch you soon. Hello and welcome to the wonderful world of the Wellcome Collection, where morbid and anatomically fascinating live comfortably side-by-side. Oh this Wellcome bloke is a bit of an oddball to say the least! I love the fact that he likes to strip things right down to the basics, bones and worms and all! These are fascinating but I sure wouldn't want them around my house. Definitely depressing!